This dish is super simple and flavor a combine perfectly! 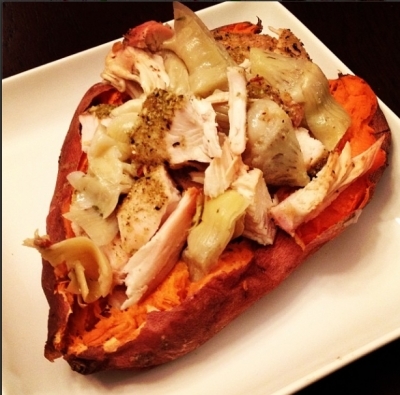 Ingredients (1 serving): 1 medium sweet potato, 1 medium chicken breast, 1/4 cup jarred artichoke hearts. Directions: Bake sweet potato and chicken breast (with seasoning of choice)on 350 for 30 minutes. Dice chicken, mix with artichoke hearts, and stuff sweet potato.